It was not unusual for Sundek to get a call requesting its decorative concrete services for a pool at a military installation. After all, the company, which has been installing its acrylic spray texture overlay on pool decks across the country since 1970, had done work specified by the U.S. Army Corps of Engineers on bases from Hawaii to Texas. Its finished surfaces are well known for their slip-resistant and cooler-than-concrete qualities. What was different about this project was its overseas location. It was about 8,000 miles from Sundek’s headquarters in Arlington, Texas... far away in Bahrain, a small island in the Persian Gulf war zone off the coast of Saudi Arabia. Specifically, the pool was in the country’s capital city of Manama, on a base that housed the U.S. Naval Forces Central Command and Navy’s Fifth Fleet headquarters. Home away from home to as many as 4,500 military and civilian personnel, some with family in tow, the installation is a critical mission support center for naval forces in the Persian Gulf, Red Sea, Arabian Sea and along the coast off East Africa as far south as Kenya. Acknowledging that the project was a logistical challenge — beginning with an eight-hour time difference between Texas and Bahrain — Sundek personnel also saw it as an opportunity to show their patriotism and support for the men and women fighting for our country. A three-man crew was selected for the Middle East assignment: Tony Hernandez, director of production; Byron Miller, commercial account executive; and Frank Hernandez, senior crew leader. Kooheji Contractors, the on-site general contractor in charge of maintaining the base, provided the labor force. As for challenges, it turns out the time difference was just the tip of the iceberg. Shipping materials and equipment from Dallas to Florida to Dubai, United Arab Emirates, to Bahrain took an unanticipated 30 to 40 days. The Texas crew arrived in Bahrain four days ahead of their shipment, putting a bit of a squeeze on the two-week schedule the Navy had allotted for the 5,000-square-foot job, says Tony Hernandez. The atmosphere on the island was a little tense during the job’s time frame in September 2009, Miller acknowledges, as families of the military were sent home right before the installation crew arrived. Everywhere he looked, he saw only military personnel in uniform. The biggest obstacle to overcome was probably the language barrier. “Basically there was only one guy (in the provided construction crew) who partially spoke English” out of about 40 people from several different countries, Hernandez says. Trying to communicate with the translator was hard enough, but then he would try to relay the message as he understood it to the others, who didn’t quite understand him. “On many occasions, he wasn’t delivering the proper message, so the message literally got lost in translation,” says Miller. Besides the language differences, lifestyles and customs added a few more stumbling blocks to the mix. As fate would have it, the project fell during the holy month of Ramadan, when Muslims refrain from drinking or eating from dawn to sunset each day. Since the crew worked together as a team, the non-Islamic members also took extended breaks even though they could eat and drink. “When originally estimating the number of man hours needed to complete the project, we used our Western-style workday as a template, only to find out that not all cultures have two 15-minute breaks and a 30-minute lunch,” Hernandez says. Another interesting challenge involved the crew’s lack of knowledge concerning modern-day equipment. “We had shipped brand-new concrete saws and other tools but they wouldn’t take advantage of them. We’d show them how to use the equipment and then five minutes later they were back to their homemade tools,” Hernandez says. They even struggled using simple tools such as putty knives that would help them achieve a straight, clean edge. “As soon as I’d turn around, they’d have them in their back pocket,” he says. “Soon, the 20 shipped putty knives were nowhere to be found,” as they had stashed them away like coveted souvenirs. 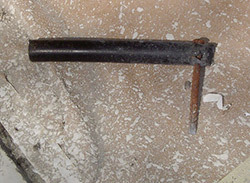 Their tool of choice, which they used for everything from chipping out expansion joints to profiling the concrete surface, was a crude chisel made out of metal or PVC pipe with a 2-inch nail at the end. “Sometimes it’s hard for us coming from a Western civilization with ready access to power tools to realize that in other countries it can be cheaper to hire five manual laborers than to purchase one powered hand grinder. The job still gets done. It just takes a little longer,” Miller says. 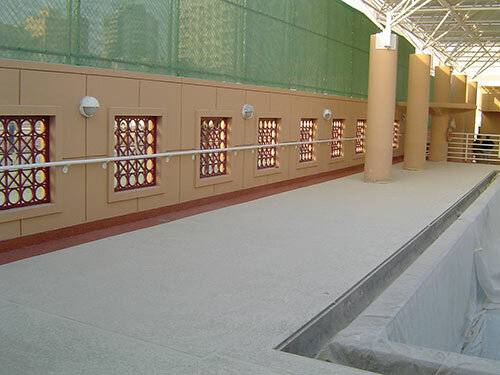 Using modern and not-so-modern equipment, the Americans and their international crew overcame what Miller and Hernandez label “the clash of the cultures.” They successfully installed a textured deck coating on schedule for the enjoyment of military personnel, civilian employees and their families in Bahrain. “It took a lot of hands-and-knees effort but we got it done,” Hernandez says. Scope of project: Install 5,000 square feet of a decorative acrylic overlay on a concrete pool deck, then stencil dolphins and an octopus in the children’s area. After painstakingly laying out a grout pattern for your acrylic overlay, meticulously masking and re-masking surrounding areas, and then spraying or troweling in just the right color and texture scheme, you stand back and admire your handiwork, and the job looks great.